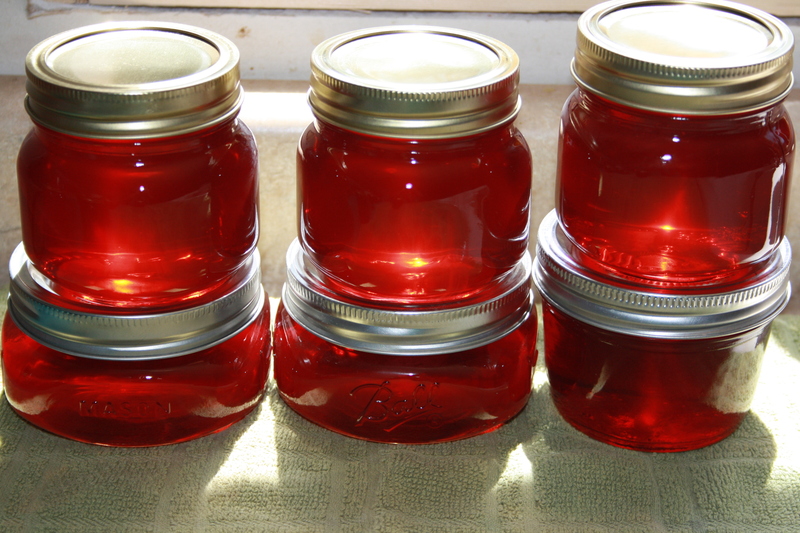 Our raspberry plants were sad this year-I know it was probably my fault for pruning a little too much this spring when all the canes looked alike-but my sweet neighbor invited me over to pick raspberries from her garden, so today I’m canning up raspberry jelly! 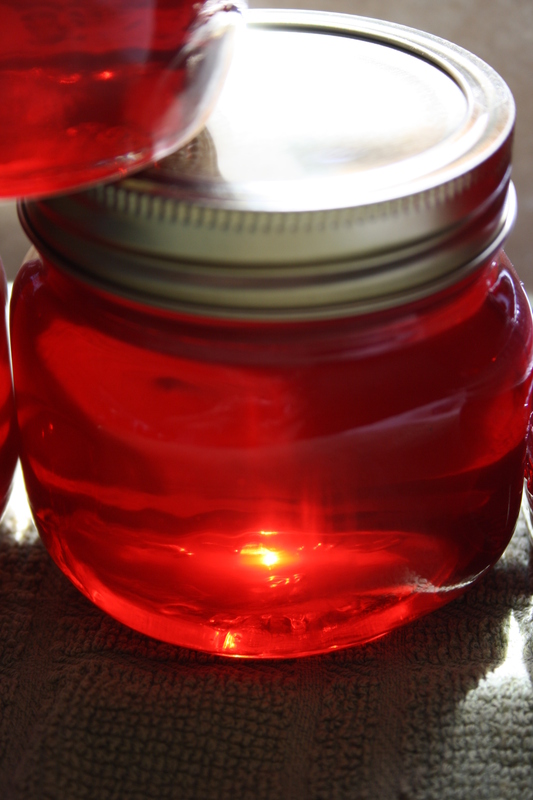 It’s one of the summer rituals I look forward to, making jars of delicious jelly to eat all winter-long. There’s a collective “NO!” when our family gets to the last jar sometime in April. 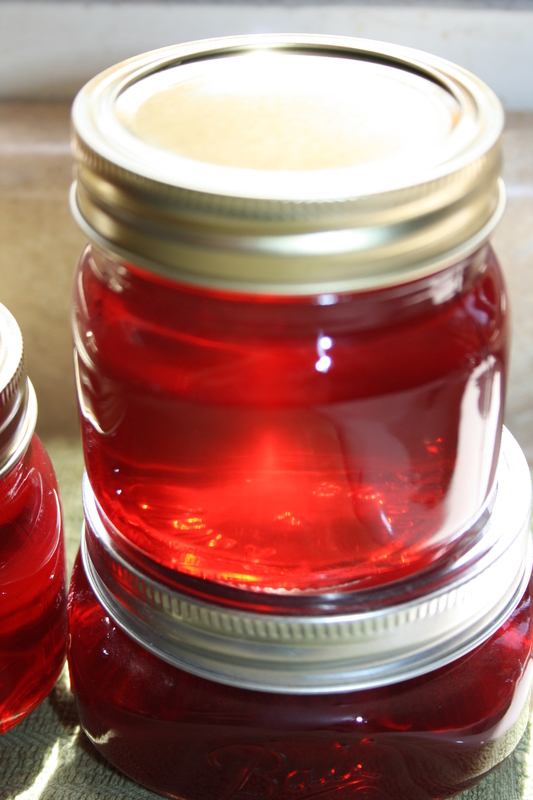 Unless you’ve had homemade jelly, you don’t know what you’re missing in the store-bought mass-produced kind. Just looking at a jar of home-canned jelly is a feast for the eyes. The colors are jewel-like and sparkle with all that harnessed summer sun. The taste is fresh and delectable. Each berry is picked at the perfect time, quality control is practiced by each picker, as well as the occasional taste-test for freshness. Only three simple ingredients go into my jellies: berry juice, pectin, and sugar. Each bite takes you back to the time you were picking the berries and how they tasted warm off the vine. It’s a taste of summer in each sweet bite! I learned my canning skills from my folks, who have been canning from their garden since I can remember. It is a lot of work-growing, harvesting, and canning food-but the flavor is unreal and you appreciate each mouthful when you are aware of all that went into providing the food on your plate. I would much rather tend a garden (which takes 2-6 months) and spend time canning (which takes at least an hour but you might as well plan your day around it) than to shop for an hour at the grocery store. It sounds crazy, I know, but there is so much joy derived from the simple pleasures of being outdoors surrounded by plants and watching them grow strong under your care. Your reward is food that not only is the healthiest for you, but tastes so amazing that you literally fall in love with food. I find myself moaning over the unbelievable flavor of sweet peas and carrots from my garden. Fresh veggies taste so amazing that you instinctively slow down and savor each bite. No salt or pepper needed, no prep work or dishes, just pick the ripest and eat! I feel sad for people who don’t know the pleasure of real food. If I could, I would teach everyone how to grow a small kitchen garden and how to can it up for winter. It’s really quite simple, and like most things in life, it’s the simple things that bring us the most joy. To anyone reading this who wants to grow something yummy, but easy, I recommend getting yourself some strawberry plants. They are perennial, meaning they come back every year, and with basic watering you will have fresh berries to enjoy in your cereal or in a strawberry shortcake dessert during the summer. You can plant them in pots, window boxes or in the ground. Grow some carrots too, because they are easy and the flavor of fresh picked is out of this world! I always tell people to start small, but just start! It’s fun, and good for you in more ways than one. But I’ll let you find out for yourself!